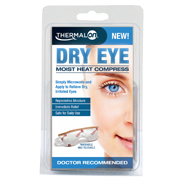 The Thermalon Dry Eye Compress is now available in Walmart stores. The dry eye compress provides doctor-prescribed moist heat to clear blocked glands, for all-natural pain relief that is quick, affordable and reusable. Millions of people struggle with dry eyes, itchy eyes and scratchy eyes…the Dry Eye Compress provides an all-natural solution for relief of all these symptoms. The Thermalon Dry Eye Compress is a natural, proven way to bring relief to dry, itchy and irritated eyes, and it is now available in the Eye Care section at Walmart. Patented Thermalon technology continuously absorbs and stores water molecules from the air. After just seconds in the microwave, the absorbed water is released as clean, moist heat. Doctors recommend moist heat to help unblock the meibomian glands. A 3-5 minute treatment and helps improve the flow of natural oils into the eyes. The compress is washable and reusable, providing an option that is drug-free, safe for use every day, and environmentally responsible. Dry eye syndrome, a common disorder of the tear film, affects over 25-30 million people in the U.S. The American Optometric Association gives a complete overview of dry eye including symptoms, causes, and treatments. There are many causes of dry eyes. Dry eyes are also commonly associated with the aging process, hormonal changes and certain diseases or health conditions. Dry and uncomfortable eyes are also a known side effect for some prescription medications. Digital eye strain is a new term being used to describe uncomfortable and/or dry eyes that result from long hours in front of a computer screen. Doctors often prescribe a warm moist compress as a solution for dry eyes. Patients often do not comply because of the mess and the lack of efficacy stemming from inconsistent temperatures and because there is not a way to keep the cloth warm long enough to complete the treatment. Drops offer short-lived relief and are objectionable to many because of their high cost and use of pharmaceuticals. Sharon Burkart, Director of Marketing for the Thermalon brand says the dry eye compress is revolutionary in dry eye treatment. “Millions of people struggle with dry eyes, itchy eyes and scratchy eyes…the Dry Eye Compress provides an all-natural solution for relief of all these symptoms.” The Dry Eye Compress is recommended for use twice a day to help improve overall eye health. Our Thermalon brand utilizes patented technology to provide drug-free pain relief that is safe, effective and simple. We offer a variety of doctor-recommended moist heat therapy and cold therapy products tailored to needs that differ based on the source and cause of the discomfort. For more information on Thermalon Dry Eye Compress visit us at http://www.thermalondryeye.com and for information on other Thermalon products, visit us at http://www.thermalon.com.